Asian elephants differ in several ways from their African relatives. They have smaller ears, which are straight at the bottom, unlike the large fan-shape ears of the African species. The Asian elephant is also much smaller. Due to habitat loss, fragmentation, poaching and culling for their ivory, and other body parts, it is now endangered and numbers between 38,000 to 51,000 wild individuals compared to more than 600,000 African elephants. Elephants, being wide-ranging species, need large areas of natural habitat to live and breed. A crucial factor in their survival is, among other things, the availability of large enough areas that are managed sustainably to meet the needs of both human and animal populations. With elephants being squeezed into increasingly smaller habitats only a fraction of its former extensive range, much needed solutions are necessary. DNA analysis shows that Asian elephants in Borneo are genetically distinct and may have separated from those in mainland Asia about 300,000 years ago. This discovery highlights the conservation importance of Borneo’s elephants. Due to their small size, gentle nature and relatively large ears, they have been dubbed “pygmy” elephants. 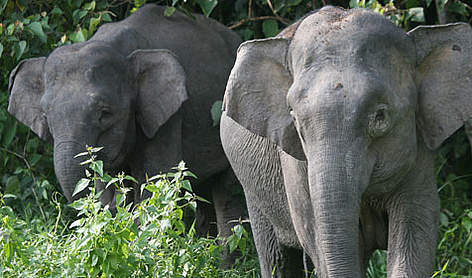 Less than 1,500 Borneo Pygmy elephants (Elephas maximus borneensis) are found, mostly in the Malaysian state of Sabah. This makes Sabah home to the world's smallest known sub-species of elephants. Smaller than other Asian elephants, the Borneo Pygmy has a longer tail that reaches almost to the ground and straighter tusks. Their babyish faces and more rotund shape lend them appeal. Males grow to a height of less than 2.5 meters compared to other Asian elephants that grow to 3 meters. Asian elephants have dark grey to brown skin. Borneo Pygmys are no different. These placid pachyderms can be greedy at times. They love durian and will roll the entire fruit - spikes and all - in mud, then swallow it whole! Borneo Pygmy elephants are shy and generally avoid people. Because their natural route and former range have been converted, they have to pass near populated areas and plantations. Herds are sometimes seen moving along the banks of the Kinabatangan River in Sabah, making the area ideal for wildlife watching. Elephants live at greater densities in lowland forests below 300 meters. They move mostly in secondary forests with an annual home range of about 300 sq km. Adult males disperse over relatively small, widely overlapping home ranges. Elephant societies are matriarchal, led by a female in small groups of around eight individuals, although larger groups can be seen gathering in open feeding grounds, particularly on riverbanks. Family groups consist of mothers, daughters, sisters and immature males. Sometimes an adult male can be associated with a herd. When not in a herd, adult males usually remain solitary. They sometimes gather in small but temporary bull herds. Contact with other family groups at such gatherings is valuable to maintain genetic diversity for their evolution and survival. These pachyderms live for up to 60 years in the wild and more than 80 years in captivity. One calf is born at a time and female Asian elephants have about 7 calves in a lifetime. They give birth about every 4 - 6 years, although this period may be extended when conditions are unfavourable for survival, such as during drought. The gestation period is between 19-22 months, almost 2 years! Calves suckle for 3 - 4 years. Borneo has a small but unique population of elephants. Several major portions of its former range have been lost in the past two decades due to displacement by large-scale agriculture. Today, these placid pachyderms are confined to the southern and eastern parts of Sabah and the northeastern tip of Kalimantan. The greater part of this single population, estimated to be less than 1,500 animals, is found in Sabah. Given the remoteness of the area and the difficulty of the rugged terrain, the Borneon elephant population represents one of the most important populations in Southeast Asia - provided its habitat remains intact. Satellite tracking shows that Sabah’s elephants spend almost all their time in lowlands and valleys. Hills and mountain ranges cannot sustain Borneo Pygmy elephants. Loss of continuous lowland forests is the primary threat to these mammals which require large feeding grounds and viable breeding populations with suitable male-to-female ratios. Shrinking forests have also brought the elephants into more contact with people, increasing human-elephant conflict. The single most important cause of the decline of the Asian elephant has been the loss of its habitat. Large blocks of forests required by elephants in Sabah have been fragmented by conversion of extensive natural forests, formerly the Borneo Pygmy’s main habitat, to commercial plantations. Human disturbances within forests such as logging and hunting also worsen contact between sub-populations of elephants.